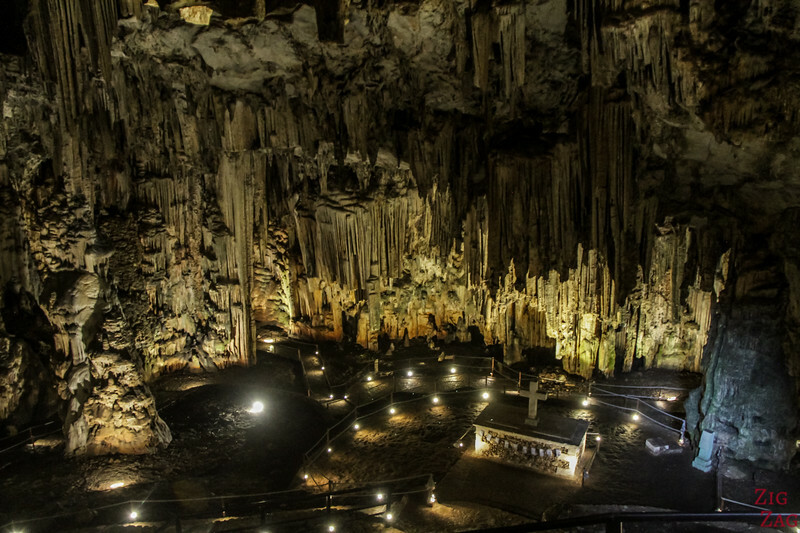 Melidoni cave Crete is one of the few underground structures accessible on the island. 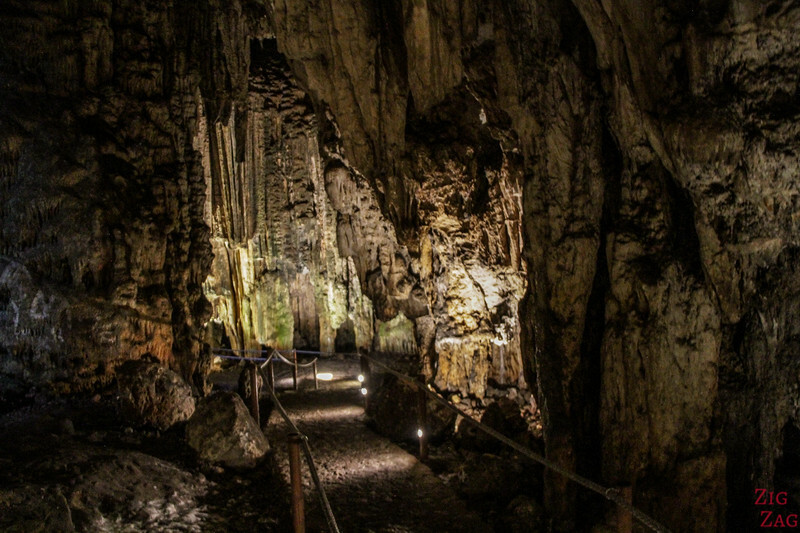 The beautiful and impressive chamber is famous for its mythology, history and geology. Below is my guide to learn more and plan your visit including how to get there, difficulty of the walk and things to see. 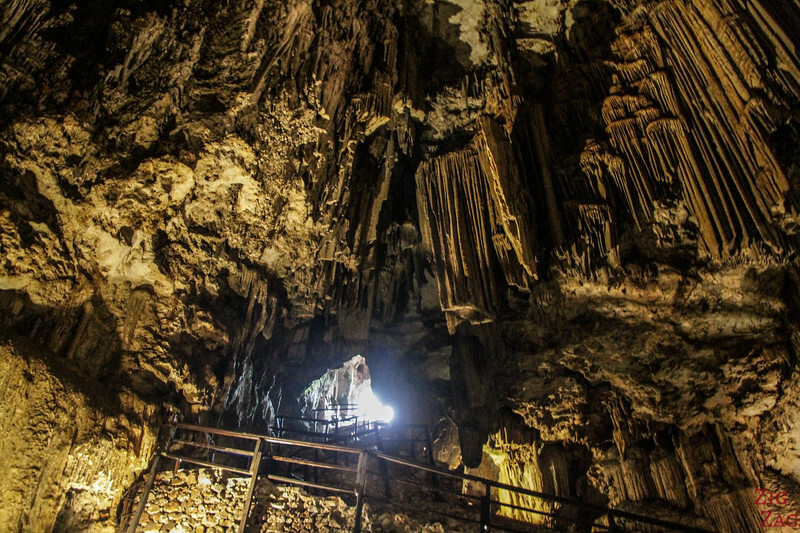 Why visit the Melidoni cave? 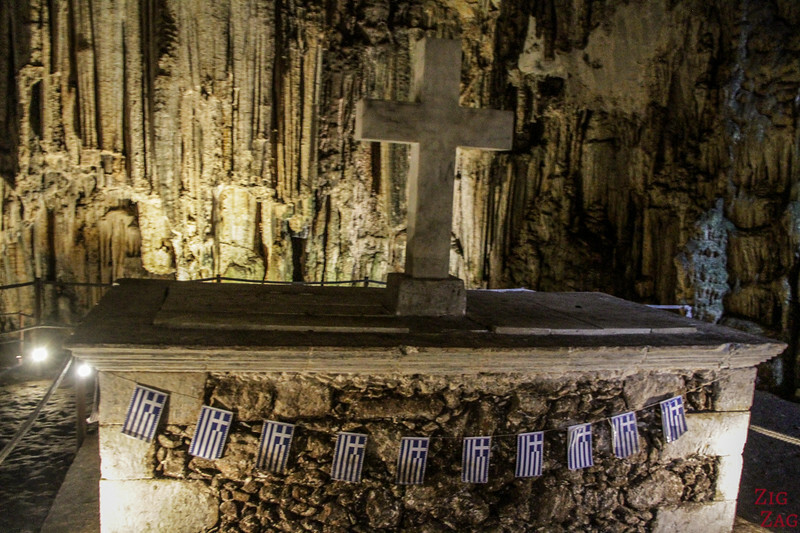 Melidoni Cave vs Cave of Zeus - which one to visit? 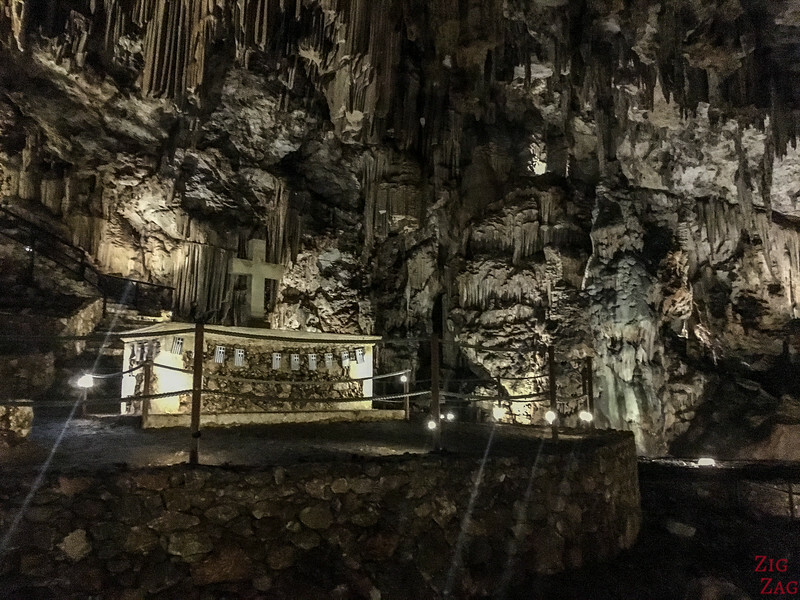 Melidoni cave has only one chamber open to the public but what a treat! The cathedral cave is huge and very impressing, with a soft lighting to appreciate the work of nature. 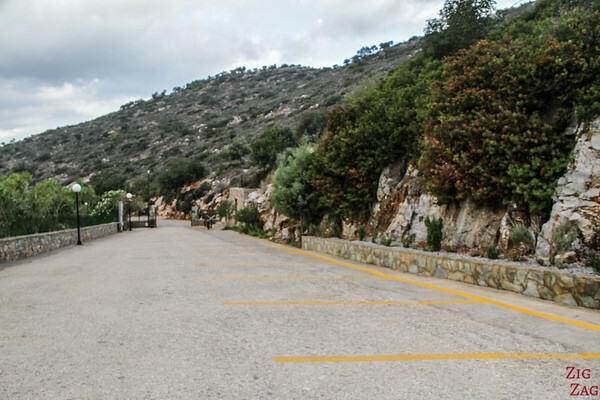 Compared to other caves in Crete, it is not too difficult to access. And it is not full of tourists! A really great stop to consider on your road trip! One of the best places to visit in Crete (see my complete list). Note: Melidoni is also sometimes referred to as Gerontospilos. Once you have paid your entrance ticket, the mouth of the cave is not far. And here you see the impressive entrance. A simple hole, that does not look like much but wait until you are inside!!!! 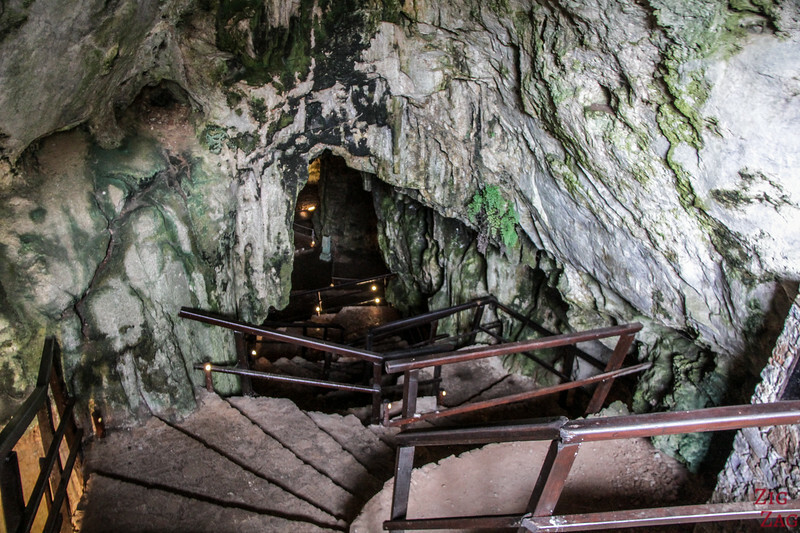 Including the steps outside of the cave from the ticket booth, I have counted 100 steps (around 80 steps inside). There is a handrail all the way down and the steps are not too difficult, just a few are high otherwise it was OK. My mum has knee problems and she was able to do it without too much pain. I enjoyed the walk down are you get peeks of what there is too come, until you discover the chamber (see next section)! And there you are: the first glance at the impressive chamber called the "Room of the Heroes". The lighting of the cave is one of the best I have seen worldwide. They have been successful at keeping the atmosphere and not making it a circus. The chamber is around 60m long and 20m wide. 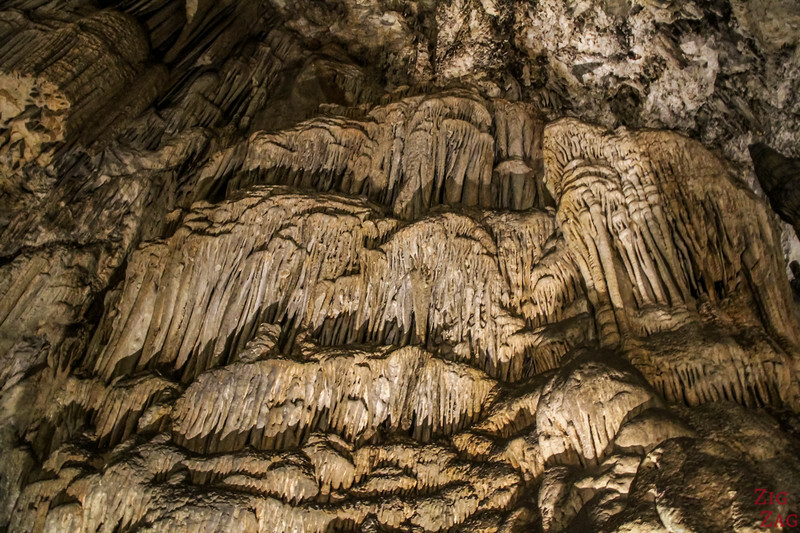 Crete has more than 4000 mapped caves (most only open to speleologists). This is one of the largest chambers under the island. It is very impressive with a just a glimpse at the small entrance where you came from. Once at the bottom, they have set up a paved path, making it is easy to walk around and admire the formations. 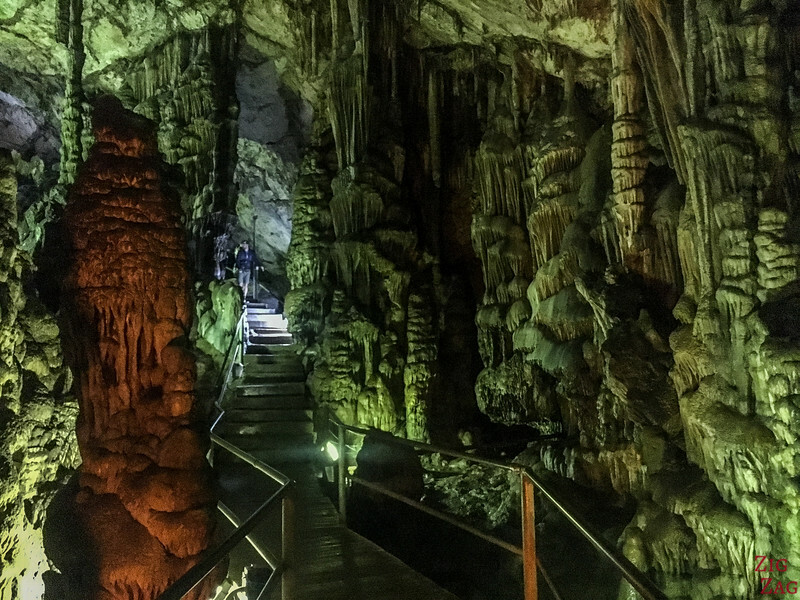 The tour is of the cave is quite short (so it is not the impressive cave systems of Slovenia for example) but still it was one of the highlights of Crete for me. I really enjoyed the ambiance and the delicate work of Nature. Plus at 9am we were alone in the cave. That does not happen often on my travels! At the end of your tour of the chamber, you climb back the same way you came in. 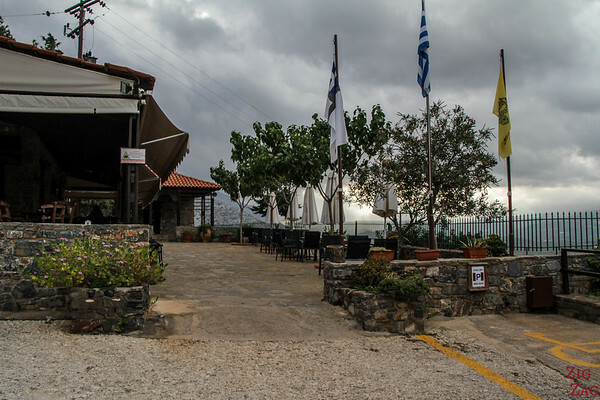 On top of the size of its chamber, Melidoni aka Gerotospilios is famous for 2 reasons: the archeological finds and the revolution massacre that took place here. As you enter the cave, one of the first things you notice is the ossuary in the middle of the chamber. During the 1824 Revolution against the Turks, villagers, including women and children had found sheltered in this cave (numbers and weapons information change depending on the source - there were between 250 and 400 people). After a siege, the Turks sealed the entrance and lit fires, suffocating everyone inside. 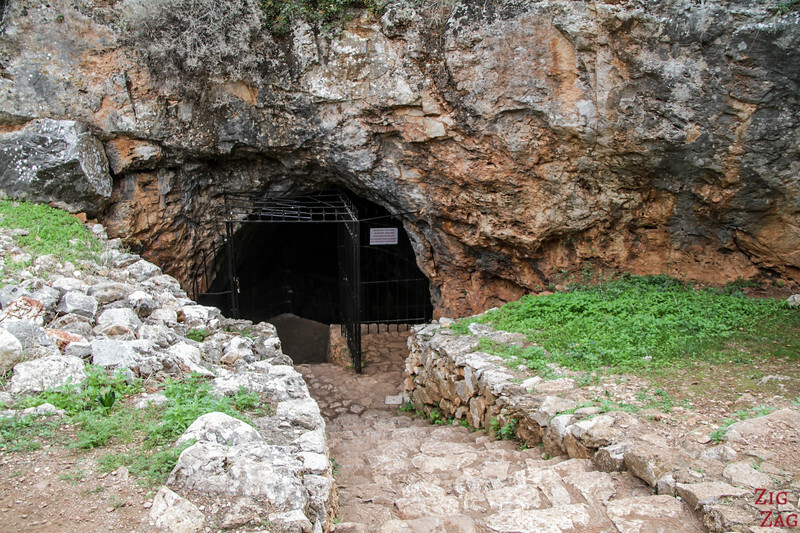 The history of the cave dates back to the Neolithic. Tools from that period were found in the cave excavations. 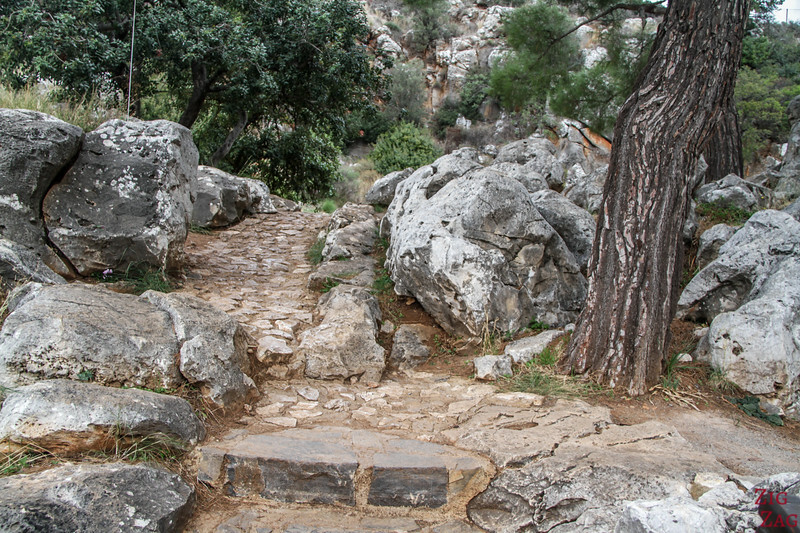 It is thought that during the Minoan period, the cave was used as a worship site. Later during the Roman empire, it was a sanctuary for the God Hermes where sacrifices happened. It was a strategic religious sites at the crossroads of 3 ancient cities. Items found in the cave include a double copper axe displayed at the Heraklion museum. The cave is also mentioned in the Greek mythology. It says that Zeus gave a giant Bronze Robot to King Minos to protect Crete and that he lived in the Melidoni cave. 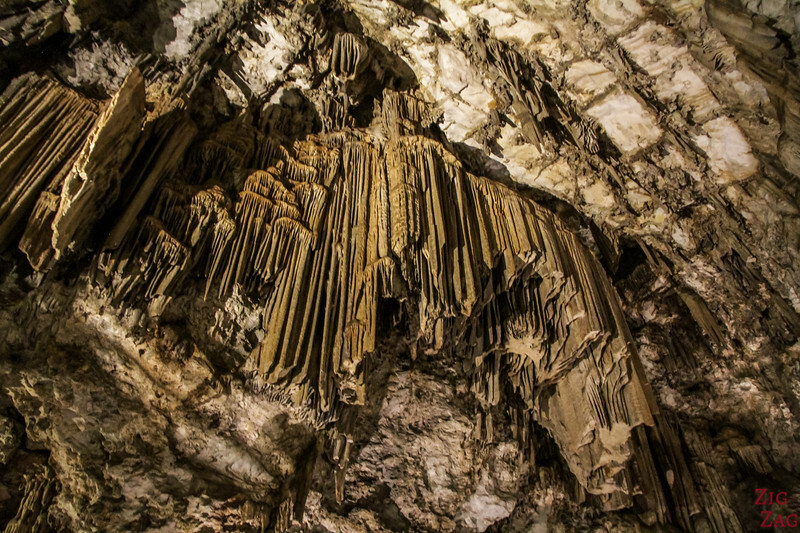 Take your time to tour the chamber and admire the many stalactite formations. They have different shapes and colors. 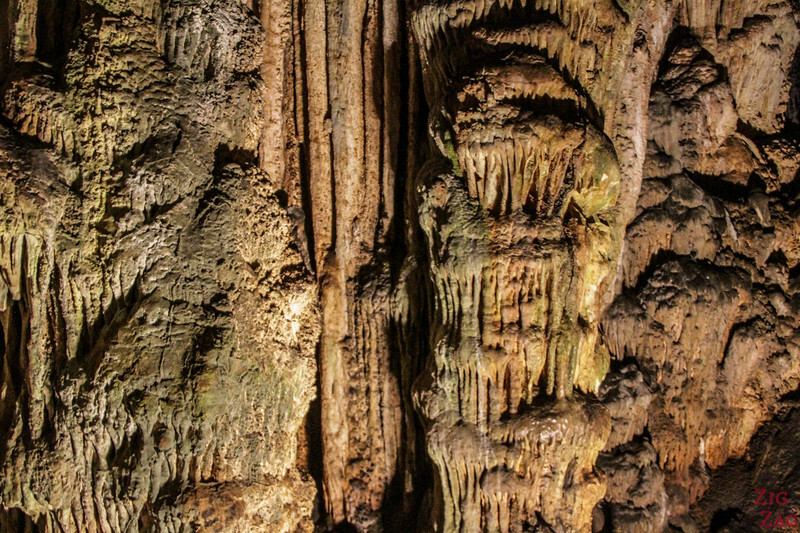 You don't have large columns like in Dikteon cave, but there work of Nature here is very delicate with thin drippings and wavy formations. Outside the cave, you can also enjoy the view over the valley. 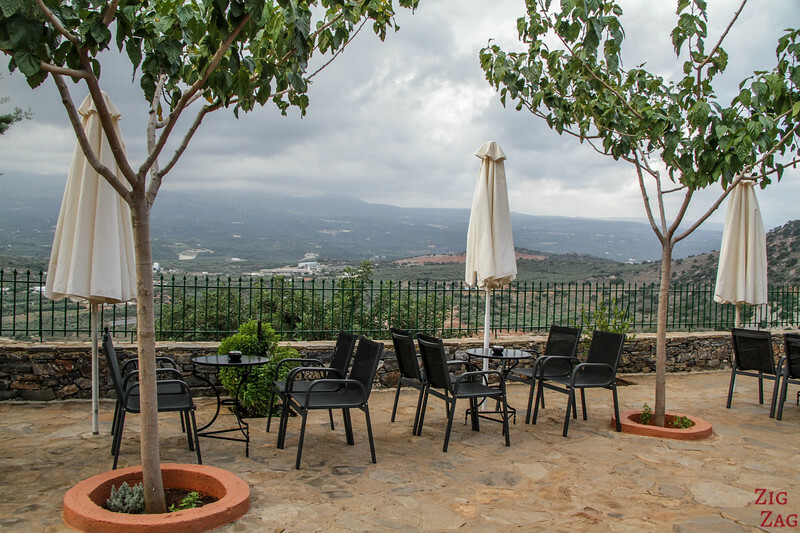 There is a café with a terrace for you to take a break, or you can simply stop to watch. 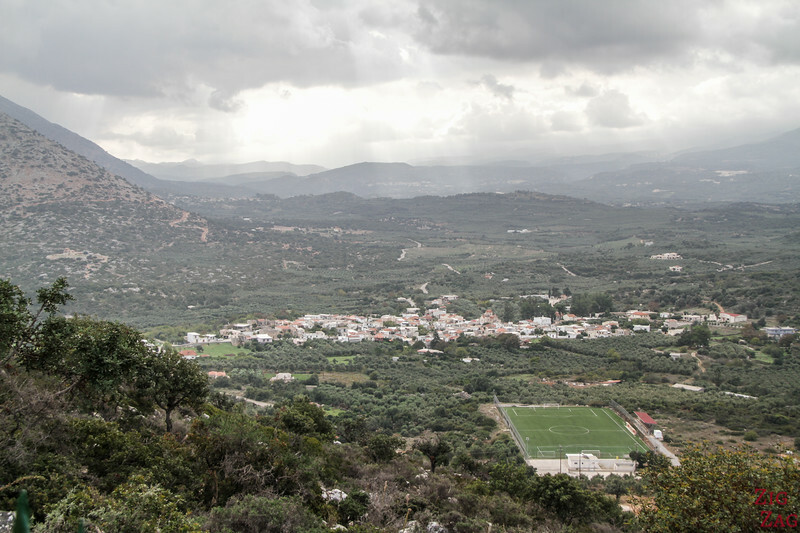 You can see the Melidoni village. You can also stop here were you can find few old Venetian buildings, but the village is now more modern. To my surprise, Melidoni cave is not as famous was the Cave of Zeus (on the Lassithi plateau also called Psychro cave or Dikteon cave). To be honest, my experience at Melidoni was much much better that the one at the Cave of Zeus. 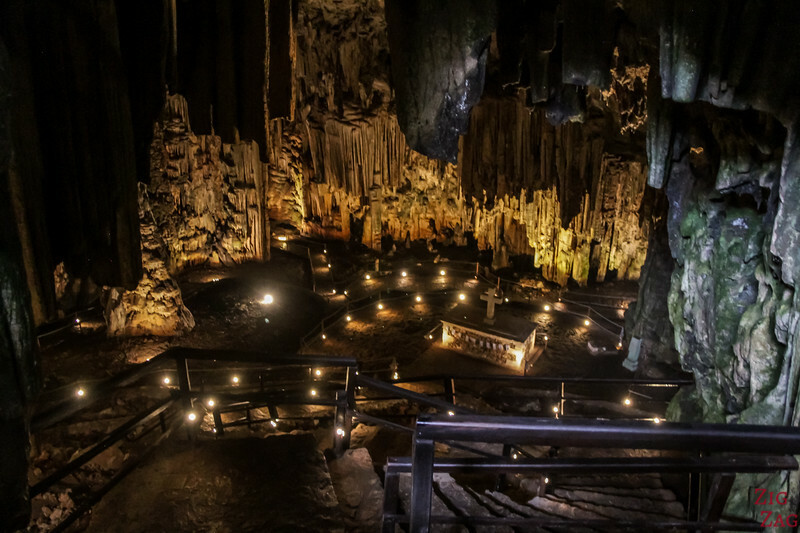 Do you enjoy visiting underground caves?